A boy looks at Turkish army tanks and armored personnel carriers moving toward the Syrian border, in Karkamis, Turkey, Aug. 25, 2016. U.S. backed Syrian Kurdish fighters say they are withdrawing to their bases east of the Euphrates River, a day after Turkey's military and allied fighters launched a cross-border offensive. The Kurdish rebels have been a source of tension between the U.S., which views them as a key ally in the war in Syria, and Turkey, which sees them as terrorists allied with separatist Turkish Kurd factions. A U.S.-led coalition spokesman said the Kurds moved east "to prepare for the eventual liberation of Raqqa." However, it is unclear if all of the Kurdish forces have withdrawn, as Turkey had demanded ahead of its offensive. Rami Abdel Rahman, head of the Britain-based Syrian Observatory for Human Rights, told Arab media that Kurdish militia fighters are still fighting on the western side of the Euphrates River and had even captured some ground. U.S. Secretary of State John Kerry walks with United Kingdom Under Secretary of Foreign Affairs Tobias Ellwood and United Arab Emirates Foreign Minister Abdullah bin Zayed on August 25, 2016, in the Royal Terminal 1 at King Abdulaziz International Airport. Turkey's foreign minister said that U.S. Secretary of State John Kerry had spoken with him in a phone call early Thursday and said that the Syrian Kurdish forces would withdraw. Vice President Joe Biden this week told Turkey's leaders that the Kurds would lose U.S.-support if they did not move back across the Euphrates. Kerry was in Saudi Arabia Thursday to discuss U.S. military operations in Syria with Saudi Prince Mohammed bin Salman, along with diplomats from Bahrain and the Gulf Cooperation Council in order to shore up support for the Syria plan ahead of meetings with Russian Foreign Minister Sergei Lavrov Friday in Geneva, Switzerland. 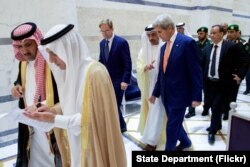 Kerry left Saudi Arabia for Geneva Thursday night and is scheduled to speak with Lavrov Friday morning. Previous rounds of negotiations have failed to produce an end to the conflict in Syria, which is complicated by U.S. and Russian support for opposite sides in the conflict. During the meeting with Lavrov, the two sides will try to come to an agreement over military cooperation and information sharing in a bid to defeat Islamic State militants in Syria. Kerry's initial plan, unveiled during July talks in Moscow, would have Washington and Moscow coordinate airstrikes against Islamic State fighters and stop the Syrian air force from launching any further air attacks. Earlier this week, Kerry said the two sides were close to ending their talks, but U.S. officials have said it's too early to know whether a deal will be reached. Russia's foreign ministry expressed deep concern about the Turkish border operation, especially Turkey's targeting of Kurdish militia fighters. Turkish army tanks and armored personnel carriers move toward the Syrian border, in Karkamis, Turkey, Aug. 25, 2016. It said that Turkey, by targeting both Islamic State militants and Syrian Kurds, could further inflame the Syrian civil war, leading to "flare-ups of inter-ethnic tensions between Kurds and Arabs." Middle East analyst Theodore Karasik told VOA that Turkey's military offensive on Syrian territory risks further complicating the war, influencing the shifting alliances among various militia factions that have made it difficult for any one side to dominate the conflict. VOA reporter Edward Yeranian contributed to this report from Cairo.